For many of you this is the first real dance floor your shoes hit when finding yourself on the long and bendy clubbing road. Walking down James Street with your friends and seeing the people in the street keen to get inside. You hear the beat vibrate through the walls and you know you are in for a treat. As you climb the stairs the DJ is throwing banger after banger – your heart races and the sudden rush hits you. For the fresh faces you can’t wait to look around, eager to lap up everything the night has to offer you. For the older crew you greet the familiar faces and instantly feel at home; with a smile you know it’s going to be another great night. The dance floor is filling… it soon gets busy… the space in front of you has gone and the place is packed. The wobbly walk to the bar… a quick trip outside to chat absolute waffle… venturing back upstairs… the place is going off… before you know it, it’s 5am and you’ve danced the night away. You have met new rave friends and friends for life, danced up a sweat, and can’t help but feel so blissful when those lights come on. The best nights are those when the sun beats you home. We at Addiction strive to be a part of these nights and can’t wait to do it all again with you. 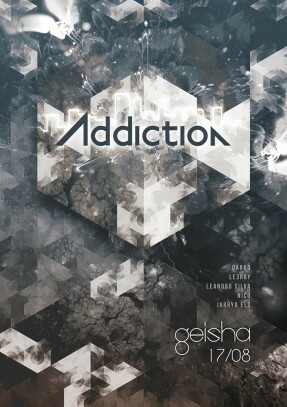 Addiction are proud to showcase the latest sounds in underground electronic music. Every event we bring you the same standard of quality house and techno in one of the coolest, underground venues in Perth. Joining us for this event will be Addiction veterans Le3Roy and Darko. Also on the line-up we have Leandro Silva, Nico & Jarryd Els.